Kennel Von Bismarck Haus Specialized on breed of Great Danes, on the varieties arlequin, black & boston. We invite you to access our webpage. Loomis Danes raise AKC Great Dane Puppies Our breeding is directed toward producing dogs of exceptional quality in breed temperament, size, and confirmation. We strive to produce puppies that are true to the breed ... gentle giants. We breed 100% huge european great danes here in North Carolina USA we can ship almost anywhere. 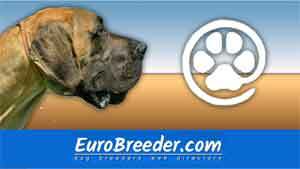 Find Great Dane Breeders in Europe.